In 1906 rookie right-hander Vive Lindaman’s 12-23 record for the Boston Beaneaters gained him admittance to an undesirable fraternity – the 20-game-loser club. But Lindaman was not without company, as three other hurlers on that hapless Boston team (Irv Young, 16-25; Big Jeff Pfeffer, 13-22; and Gus Dorner, 8-25) posted similarly dismal marks, giving Boston the rare distinction of having four 20-game losers on the same pitching staff. Unhappily for Lindaman, he would spend the remainder of his four-year major-league career in a Boston uniform, pitching decently but never enjoying a winning season. Lindaman fared better once he was finished with baseball. A sober, hard-working man, he developed a thriving livestock and dairy operation in his native Iowa and had become the leader of an animal breeding association by the time he was felled by a stroke at the age of 49. Seeds of later confusion were sown when the Pittsburgh front office received a contract signed by Vive A. Lindaman. Club secretary Win Locke assumed that the name must have been a misprint and assigned the club’s new hurler the name Victor.13 By whatever moniker, Lindaman pitched well enough in spring camp to earn a spot on the Pirates’ Opening Day roster. Star third baseman-outfielder Tommy Leach playfully informed the press that the club’s rookie right-hander, a carpenter by trade, had invented a new pitch: the auger twist.14 By this time, however, Lindaman had adopted the spitball as his out-pitch. But he never got a chance to use it with the Pirates. A month into the 1905 season, Pittsburgh released him to the Jersey City Skeeters of the Eastern League without Lindaman’s ever having made a regular-season appearance for the Pirates.15 Despite getting off to a belated start, Vic Lindaman quickly established himself as the Eastern League’s finest pitcher, posting a 24-7 record for the third-place (81-49) Skeeters, while leading the circuit in winning percentage (.774). On April 14, 1906, 28-year-old Vive Lindaman made a brilliant major-league debut, shutting out Brooklyn, 1-0. But pitching for a terrible team soon took its toll on Lindaman’s stats. The last-place (49-102) Beaneaters were the National League’s worst hitting team (with a .226 team batting average); committed 337 errors in the field;19 and finished 66½ games behind the pennant-winning Chicago Cubs. Like other Beaneaters hurlers, Lindaman was often victimized by nonsupport; Boston was shut out in eight of Lindaman’s starts. Lindaman, however, rarely did anything with the bat or glove to help his own cause. He hit a feeble .132, with only 3 RBIs in 106 at-bats, and led NL pitchers in errors committed with 14. But overall, Vive’s dismal 12-23 (.343) pitching record was deceptive. He posted a fine 2.43 ERA over 307? innings pitched and completed 32 of his 36 starts. He struck out 115, while walking 90. Throughout the season, Boston manager Fred Tenney abused his starting rotation. Apart from the club’s four 20-game losers, the remainder of the staff registered only seven decisions, all losses. By September Lindaman and fellow starter Gus Dorner both had lame arms. Thereafter, insult was added to injury. The National Commission levied a $100 fine on Lindaman for pitching for an independent nine in Chicago on an offday.20 Although a fairly common occurrence at the time, Lindaman had made the error of playing (under the assumed name of Evans) for the Logan Square Braves, a Chicago city-league team owned and managed by ex-big leaguer Jimmy Callahan that American League President (and National Commission member) Ban Johnson was particularly determined to suppress.21 Vive would be on Organized Baseball’s ineligible list until the fine was paid. The Lindaman sanction was intended to serve as a deterrent to other major leaguers tempted to earn a little extra cash by playing games for independent or city-league teams outside the National Agreement, a practice forbidden by a heretofore dormant Rule 47. Lindeman cared little about the broader aims that his discipline was intended to advance. Ordinarily a good-natured, personable man, he bitterly resented the sanction and expected George Dovey, new principal owner and club president of the now Boston Doves, to pay the fine. When Dovey informed Vive that he could not, Lindaman refused to sign his 1907 contract and began a holdout.22 With the parties at loggerheads, Vive turned his attention to domestic matters. On February 5, 1907, he and sweetheart Mabel Elizabeth Burns, a popular Charles City schoolteacher, were married in the rectory of Immaculate Conception Roman Catholic Church.23 In time, the couple would have seven children: Kathryn (born 1908), Doris (1911), Robert (1914), Benton (1916), Vivan (Jack, 1920), Richard (1922), and Joseph (1924). The Lindaman holdout was short-lived. He reluctantly paid the $100 fine, was restored to good standing by the National Commission, and signed his Boston contract.24 But Vive reported to spring camp late, overweight, and still nursing arm miseries. He got off to a fast start, winning his first three decisions, but thereafter reverted to sub-.500 form. In late May the unavailability of umpire Jimmy Johnstone (shaken up in an auto collision) necessitated the use of players as arbiters in a Boston-Brooklyn doubleheader. In Game 2, Superbas spitballer Elmer Stricklett called balls and strikes without incident, but Vive Lindeman on the bases was another matter. A call at first caused Brooklyn shortstop Phil Lewis to charge Lindaman “bellowing like a bull.”25 Lindaman thereupon ejected Lewis, who would not leave the field until pulled off by Brooklyn manager Bill Donovan. Brooklyn, minus Lewis, prevailed in 13 innings, 4-3. The next day, Lindaman, no worse for the experience, returned to the mound and beat the Phillies, 6-3. In June a headache to statisticians and record keepers past and present was aggravated: Boston added Ernie Lindemann to the pitching staff. “One is Lindaman and the other is Lindemann,” advised the Evansville Courier and Press, “and while in no way related, both are from the best of families.”26 Mercifully, Lindemann’s stay in Boston was brief. After recording a no-decision in his only major-league start, Ernie was dropped from the roster. Lindemann later hooked on with the Hartford Senators of the Class B Connecticut League, whereupon the sports press reverted to calling him Lindaman.27 Meanwhile back in Beantown, his namesake was completing an unsatisfying sophomore campaign for another bad (58-90) Boston club. Although Vive’s 11-15 (.423) record showed modest improvement, his pitching had not. In 260 innings, his ERA rose to 3.63, high for a Deadball Era starter and more than an earned run per game higher than in his rookie season. Lindaman had also been wild, recording considerably more walks/hit-batsmen (123) than strikeouts (90). In addition, he surrendered a NL-leading 10 home runs. Vive rebounded with his best major-league season in 1908. He went 12-16 (.429), with an excellent 2.36 ERA, and led the Boston staff in game appearances (43), innings pitched (270? ), and ERA, while tying teammate Patsy Flaherty for most wins and complete games (21). Lindaman’s two career highlights also occurred during the campaign, and both came against the Chicago Cubs, on their way to a second consecutive National League pennant and World Series crown. On June 4, 1908, Lindaman and Jack Pfiester both went the distance in a 17-inning 1-1 tie, with Vive allowing the Cubs only five hits over the distance. Six weeks later, Lindaman achieved the “highest ambition” of his career,28 a 5-0 whitewash hurled against Chicago and future Hall of Famer Mordecai “Three Finger” Brown. Shortly after the funeral, Boston management, now under the direction of George’s younger brother John S.C. Dovey, decided to clean house. First to go was manager-catcher Frank Bowerman, dismissed on July 19. The club then placed a number of veterans on waivers, including Lindaman, whose 1909 pitching log stood at an unsightly 1-6, with a 4.64 ERA. There were no takers on the major-league level and Vive frustrated an effort to send him to Hartford by refusing to report. Thereafter, he was given his unconditional release.31 “I’m not out of baseball,” said Vive, taking his leave of the Boston clubhouse. “I’m going home to see the folks out West for a little while, but you’ll hear of me working again soon.”32 It was not to be at baseball’s highest level. Lindaman would continue to pitch for several more years, but his major-league career was now behind him. In four seasons he had posted a cumulative 36-60 (.375) record for Boston teams that had gone a combined 215-391 (.355). His 2.92 ERA over 904 innings pitched and .263 opponents’ batting average were Deadball Era respectable, but he had periodically been hampered by control problems. His walks/hit-batsmen total (333) exceeded his strikeouts (286). In the final analysis, Vive Lindaman had been better than his won-lost record, a competent major-league pitcher pulled down by the awful teams he played for. Now 33 years old but wishing to give the game a final shot, Lindaman benefited from his acquaintance with Del Howard, a former Boston teammate and now manager of the Louisville Colonels of the American Association. Howard signed Vive in March 1911.38 But the old spitballer had little left, and was released in early June after going 1-3 in eight games for the Colonels.39 Lindaman arrived back in Charles City in time to pitch the locals to a victory over the Keystones, a barnstorming black team from Minnesota.40 He was also on the mound for Charles City during an 18-2 drubbing of Marble Rock before some 2,000 fans attending the Floyd County Fourth of July picnic.41 For the most part, however, Vive focused on re-establishing ties to his birthplace and beginning a new life as a livestock breeder. His final connection to baseball came in 1913 when he agreed to coach the University of Iowa baseball team.42 The Hawkeyes posted an 8-8 record in Lindaman’s lone year at the helm. Once he put baseball behind him, Lindaman concentrated on the welfare of his steadily expanding family and the operation of a 40-acre farm in Saint Charles, a large but sparsely populated township that surrounds Charles City.43 Initially, Viva (as he was now called) specialized in the breeding of Durocs, a large domesticated hog, and soon assumed an active role in the Floyd County Breeders Association. In January 1918 he was elected the treasurer of the association, a post he retained during the coming decade.44 In time, the financial success of the venture – a single Duroc could fetch a $1,500 sale price – permitted expansion of the farm operation to include maintenance of a dairy herd. On February 13, 1927, electricity and other utilities were installed on the property.45 When Vive failed to appear for dinner that evening, his wife went looking for him and found his body in an outbuilding.46 The coroner subsequently determined that Lindaman had suffered a sudden and fatal stroke (apoplexy).47 He was only 49. After services conducted at the family-owned Lindaman Brothers Funeral Home, his remains were interred at Calvary Cemetery in Charles City. The untimely death of her husband left Mabel Lindaman with a business to run and seven children, aged 2 to 19, to raise. She succeeded admirably on both scores. With later help from her sons, she transformed Lindmere Farms into an industry standard-bearer. By the time of her death in 1950, Mabel had “become known throughout the state for her knowledge on livestock production.”48 With the exception of son Bob, who emigrated to California, the Lindaman children spent their lives in and around Charles City, contributing to both its social and civic welfare. And early in the present century, Charles City, doubtless stimulated by a three-part biographical profile of Vive Lindaman published in the Charles City Press, took renewed interest in the long-deceased ballplayer.49 In August 2010 Vive Lindaman Day was concluded with the donation of Vive’s Boston Doves uniform and other memorabilia to the Floyd County Museum.50 A year later, auction of a 1906 Lindaman baseball card on eBay brought $305 into the coffers of a community education fund.51 Thus, in ways large and small, his birthplace endeavors to preserve the memory of Vive Lindaman, to this day the only Charles City native ever to wear the uniform of a major-league baseball team. The writer is indebted to Laura Hughes of the Charles City Public Library for providing much of the local reportage used in this profile. Sources for the biographical information provided herein include the Vive Lindaman file at the Giamatti Research Center, National Baseball Hall of Fame and Museum, Cooperstown, New York; family tree information accessed via Ancestry.com; and various of the newspaper articles cited below, particularly a three-part biographical profile of Lindaman by Bill Burge published in the Charles City (Iowa) Press, December 16-18, 2009. Statistics and other baseball-related information have been taken from Retrosheet, Baseball-Reference.com, and The Encyclopedia of Minor League Baseball, Lloyd Johnson and Miles Wolff, eds. (Durham, North Carolina: Baseball America, Inc., 2nd ed., 1997). 1 According to a March 19, 1971, letter by daughter Kathryn Lindaman Hayes, contained in the Vive Lindaman file at the GRC. 2 As per the Lindaman family. See “Vive Lindaman,” by Bill Burge, Charles City (Iowa) Press, December 16, 2009. 3 Vive’s known siblings were brothers Charles (1863-1928), Alva (1865-1914), Walter (1867-1947), and Guy (1884-1947). 4 Burge, Charles City Press, December 16, 2009. 5 As per the Boston American, April 9, 1908. See also Sporting Life, September 28, 1904. 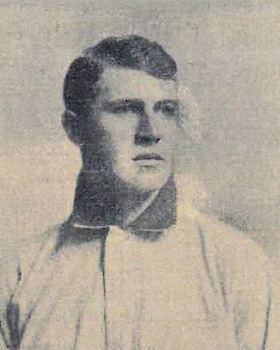 6 Apparently through Lindaman’s intervention, Brush appeared in two April 1907 games for the Boston Doves. Prior to that, Brush had not played professional baseball since 1897. 7 As later recalled by Lindaman in the Seattle Daily Times, April 17, 1910. 9 Ernie Lindemann’s surname was frequently given as Lindaman on newspaper sports pages. Vive Lindaman and Ernie Lindemann would later be together in the Pittsburgh Pirates’ spring camp of 1905 and perhaps with the Jersey City Skeeters later that season (baseball reference works conflict on the matter). Thereafter, Lindaman and Lindemann were briefly reunited on the 1907 Boston Doves. The confusion of the two men and their pitching records was chronic, and persists to this day. 10 Baseball-Reference.com provides only games and walks for Lindaman at Sioux City. The stats above were published in The Sporting News, October 22, 1904. 11 Sporting Life, August 20, 1904. 12 As reported by Pittsburgh sportswriter A.R. Cratty in Sporting Life, September 3, 1904. 13 As per Sporting Life, March 18, 1905. 14 As reported in the Washington Post, April 25, 1905, Sporting Life, May 13, 1905, and elsewhere. 15 As reported in the Cleveland Leader, May 17, 1905, and Jersey Journal (Jersey City), May 18, 1905. Days later, it was reported that the Pirates had sold Ernie Lindemann to a Jersey City rival, the Montreal Royals. See Sporting Life, May 20, 1905. But the 1906 Reach Guide (page 147) states that on May 16, 1905, “Pitcher Ernest V. Lindemann was sold by Pittsburgh to the Jersey City club.” In any event, Baseball-Reference lists Lindemannn as having spent the 1905 season with Jersey City, not Montreal. 16 As reported in the Cleveland Plain Dealer and Washington Post, September 2, 1905. Meanwhile, an attempt by the Philadelphia Phillies to draft Lindaman from the Jersey City roster was disallowed by the National Commission. Sporting Life, September 5, 1905. 17 See the Boston Journal, December 18, 1905. The following year, the Lindaman profile, complete with the erroneous claim that he had made his pro debut in Waterbury, was republished in Sporting Life, May 19, 1906. 18 Boston Herald, January 27, 1906. 19 According to the Cincinnati Reds, Lindaman threw the “spittiest” spitball in the National League, and many of the infield errors committed behind him were caused by the gobs of expectorant that he put on the ball. “Lindaman fairly soaks the ball,” said one Red. “That’s why infielders make so many wild throws in games that he officiates. They get hold of that slippery ball and can’t govern their throws to first.” Cincinnati Post, September 25, 1906. 20 As reported in the Boston Herald, Pawtucket (Rhode Island) Times, and Washington (DC) Evening Star, November 3, 1906. 21 Johnson informed the press that the sanction would have been only $50 had Lindeman admitted, rather than denied, playing for the Logan Square Braves. The $100 fine was said to be the equivalent of what Lindeman had been paid by Callahan for his appearance. Chicago Tribune, November 3, 1906. 22 As per the Boston Herald, January 31, 1907, and Sporting Life, February 9, 1907. 23 As reported in the Charles City Press, February 7, 1907. Mabel was a parishioner at Immaculate Conception but her marriage to a nonpracticing Methodist probably occasioned the removal of the ceremony from the church proper. The Lindaman children would be raised Catholic. 24 As reported in the Richmond Times-Dispatch, March 2, 1907, San Francisco Chronicle, March 7, 1907, and elsewhere. 25 As per the Boston Herald, May 31, 1907. 26 Evansville (Indiana) Courier and Press, July 11, 1907. 27 See, e.g., Sporting Life, August 17, 1907. 28 According to the Chicago Examiner, July 22, 1908. 29 Sporting Life, March 21, 1909. 30 As reported in the Pawtucket Times, June 23, 1909, Sporting Life, July 3, 1909, and elsewhere. 31 As reported in the Trenton Times, July 27, 1909, and Sporting Life, August 6, 1909. 32 Boston Herald, July 27, 1909. 33 As reported in the Duluth (Minnesota) News-Tribune, August 1, 1909. See also the Belleville (Illinois) News Democrat, September 10, 1909. Signing with Indianapolis reunited Lindaman with his former Boston manager and backstop Frank Bowerman. 34 As reported in the Harrisburg (Pennsylvania) Patriot, August 6, 1910, and Sporting Life, August 20, 1910. 35 Trenton Times, August 17, 1910. The assignment completed a deal through which Indianapolis had earlier acquired left-hander George “Lefty” Craig from Trenton. 36 As per the Harrisburg Patriot, September 6, 1910. See also Sporting Life, January 7, 1911. 37 As per Sporting Life, November 5, 1910. 38 As noted in an unidentified March 7, 1911, news article contained in the Vive Lindaman file at the GRC. 39 Lindaman’s release is reported in the Lexington Herald, June 6, 1911. Baseball-Reference has no data for Lindaman in 1911. Lindaman’s record at Louisville is taken from American Association statistics published in the Cleveland Leader, October 1, 1911. 40 Per Todd Peterson, Early Black Baseball in Minnesota (Jefferson, North Carolina: McFarland, 2010), 157. Lindaman pitched a five-hitter against the Keystones. 41 As reported in the Marble Rock (Iowa) Journal, July 6, 1911. 42 As reported in the Grand Forks (North Dakota) Evening Times, March 11, 1913. 43 Although the Lindaman farm had a Charles City mailing address, the property was located entirely in Saint Charles, a separate and distinct municipality that surrounds Charles City on all sides. 44 Lindaman’s assumption of the post was reported in the Marble Rock Journal, January 24, 1918. 45 According to the Charles City Press retrospective on Vive Lindaman, December 18, 2009. 46 As per the Charles City Twice-A-Week News, February 15, 1927. 47 As per the death certificate contained in the Vive Lindaman file at the GRC. 48 As per the Mabel Burns Lindaman obituary published in the Mason City (Iowa) Press Gazette, October 23, 1950. 49 See Bill Burge, “Vive Lindaman,” Charles City Press, December 16-18, 2009. 50 As reported in the Charles City Press, August 16, 2010. 51 As per the Charles City Press, March 13, 2011.